Swedish comedy "A Pigeon Sat on a Branch Reflecting On Existence" has a very particular style of deadpan humor and an equally specific morbid sense of empathy. As in his previous two films, writer/director Roy Andersson ("Songs from the Second Floor," "You, The Living") presents several thematically-united sketches of life as it's experienced by the meek, and the suffering, two groups of people who are (according to Andersson’s films) doomed to inherit nothing. 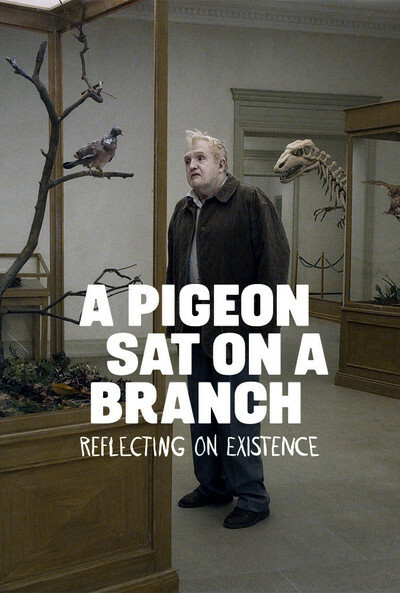 "A Pigeon Sat on a Branch Reflecting on Existence" is, in that sense, a kind of alarmist comedy. It’s a series of comedic sketches about people who are too self-involved to empathize with each other. It’s also a plaintively blunt wake-up call, and an effective demand for viewers' vigilant sensitivity. I'm writing this review as a series of direct free-associations because that's essentially how "A Pigeon Sat on a Branch Reflecting On Existence" presents itself. Like Andersson's other recent films, "Pigeon" is a movie that's so viscerally effective that it doesn't really matter how hard individual scenes clobber you over the head with Andersson’s humanist message: by choosing to isolate ourselves from each other, we die a thousand little absurd deaths every day without ever really moving on. “A Pigeon Sat On a Branch Reflecting on Existence” doesn’t really have a plot, but it does feature two recurring characters: Jonathan (Holger Andersson) and Sam (Nils Westblom) sell novelty items, but aren't very good at it. They're shy and tactless, as we see in any scene where they try to pitch people who could clearly care less about plastic vampire fangs, and rubber Halloween masks. But Jonathan, who is repeatedly teased for being over-sensitive, also suffers from a vague sinking feeling that something is wrong with his life, and that leads to problems with Sam later on. To be fair, Jonathan's not completely blameless. In one scene, we see him bullying a store-owner who is too anxious and depressed to address Jonathan and Sam when they demand payment for novelty items that were bought on credit. It's an awkwardly heated argument since Jonathan and Sam have to argue with their client through a third party: the store-owner’s wife. Jonathan and Sam's seeming lack of empathy is what unites them with the various other people in "A Pigeon Sat On a Branch Reflecting on Existence." Several characters receive phone calls that lead them to miss whatever situation is happening right in front of their eyes, like the callous scientist who ignores a monkey she's performing electroshock therapy on or the desperate barber who doesn’t see his reluctant (and only) client leaving his barber shop. Each time this happens, the person on the phone ironically says "I'm glad that you're doing fine," reminding viewers that the opposite is actually true, and that a state of un-fine-ness is actually what passes for normalcy in Andersson’s film. Andersson is not however a pessimist nor is "A Pigeon Sat On A Branch Reflecting on Existence" a cynical film. On the contrary, "Pigeon" leads viewers through a series of comically bleak vignettes towards a hopefully open-ended conclusion. In a 2009 interview published in MuBI by former "At the Movies" co-host Ignatiy Vishnevetsky, Andersson describes his simultaneously unsparing but ennobling sensibility as "a light without mercy." Vishenvetsky correctly adds that "There's a difference between being ‘without mercy’ and being cruel." You can see exactly what Vishnevetsky means in the most confrontational scene in "Pigeon:" a dream sequence wherein white blue bloods set a giant container full of black slaves on fire, and watch as the container revolves slowly and makes music. The painfully deliberate pacing of this scene makes it surprisingly shocking. You realize what's happening well before the scene is over, but by the time the scene ends, you'll also realize that you've just seen the most serious scene in "Pigeon." It's a howl of inflexible indignation that informs the rest of the film's slippery pre-apocalyptic comedy. Andersson is able to essentially lecture his audience into laughing at his funhouse reflections of human insensitivity because he has a very exact style, one that he's honed after directing hundreds of equally surreal commercials. Andersson takes his time behind the camera. He typically reshoots scenes that feature only a handful of dialogue over and over again, sometimes several dozen times. He doesn't agonize over shots, according to line producer John Carlsson, but rather just chooses them at his own pace. That sensitivity shows in "Pigeon"'s sets: life-like models and fixtures that make you feel like you're looking at street scenes when in fact you're looking at vividly detailed interior sets that also retain a magical kind of artificiality. The film's interiors are similarly shot like tableaux vivants that just barely come alive whenever a zombie-like protagonist trudges through. The world of "A Pigeon Sat on a Branch Reflecting on Existence" is, in that sense, fragile, but not really moribund. Andersson's hysterically impotent characters may, in other words, be perpetually on the verge of a spiritual breakdown, but they never completely fall apart. That kind of mulishly stubborn resilience is very human, and also very funny.